Chocolate cupcakes, filled with salted caramel, topped with buttercream and sprinkled with flaky sea salt. The ultimate cupcake flavour. Start by making the chocolate cupcakes. 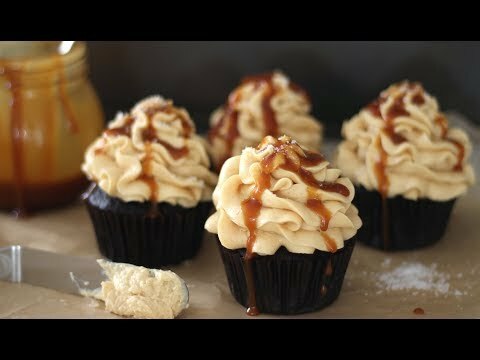 I think nothing goes better with salted caramel than chocolate, but say if you thought differently than me you can make these with vanilla cupcakes. I’ll have the recipe for those linked in the information box below. In a medium sized mixing bowl measure out all of the dry ingredients, the all purpose flour, unsweetened cocoa powder, granulated sugar, baking powder and baking soda. This recipe calls for both baking powder and baking soda. Make sure to use them both, as they have different effects on the recipe. The baking soda is activated by the acid in the cocoa powder, helping to neutralise it, and the baking powder is used to rise the cupcakes so they become light and fluffy. If you would like the full recipe for these chocolate salted caramel cupcakes it will be on my website, as well as the full measurements listed in the information box below. There is no need to sieve the dry ingredients, use a whisk or a wooden spoon to remove any lumps and combine the ingredients together. Set the dry ingredients to the side while measuring out the wet. In a smaller mixing bowl measure out half a cup or a stick of butter. You need to melt the butter, you can do this either in a microwave or on the stove. Once melted leave the butter to cool for about 5 minutes so it isn’t hot while mixing with the other ingredients. Add the milk to cooled butter along with 2 medium sized free range eggs. Use a fork to whisk the butter, milk and eggs together until they are evenly combined. Pour the wet ingredients into the dry and use a wooden spoon to fold the cupcake batter together. Be careful not to over mix, as this develops the gluten leading to very dry and tough cupcakes. Keep mixing until you no longer see any dry flour, don’t worry if there are a few lumps, these won’t harm the cupcakes. Scoop the cupcake batter into 12 cupcake liners, or if you are not using liners make sure you’ve sprayed the tray so the cupcakes don’t stick. Place the cupcakes into a 180 degree Celsius or 350 Fahrenheit preheated oven for about 20 minutes or until the cupcakes spring back when pressed. Cool the cupcakes in the tin for 5 minutes before transferring to a wire rack. While the cupcakes are cooling, get started on the salted caramel buttercream. To the bowl of a stand mixer, or a large mixing bowl if you are using a hand mixer, add the room temperature butter. Using the whisk attachment beat the butter for about 5 minutes on medium to high setting until it has turned a very pale shade and almost doubled in volume. While the butter is beating measure out the icing sugar, also known as powdered sugar or confectioners sugar, just different names. You’ll need about 3 cups worth. Use the spatula to scrape down the bowl a few times so nothing gets stuck to the sides. Once the butter has whipped up slowly start to add the icing sugar. I usually do this in thirds, scraping down the bowl each time so everything is evenly combined. The last ingredient you will need for this buttercream is salted caramel sauce, you can buy some if you would like, or it only takes about 10 minutes to make your own. I have a recipe for salted caramel sauce on my channel which I will have linked in the information box below. Make sure your sauce is at room temperature and add about 1/3 of cup to the buttercream. Mix for another minute or so until everything is evenly combined. Taste test the buttercream and add a little more salt if necessary. Take a cupcake, I like to use a pipping nozzle for this and cut out a small amount. Fill the cupcake with your salted caramel sauce and pipe on a generous amount of the salted caramel buttercream. If you don’t have a piping bag you can use a knife to spread over the buttercream. Drizzle the cupcake with salted caramel sauce and a sprinkle of flaky sea salt. Repeat with the remaining cupcakes and serve. These will stay fresh in an air tight container at room temperature for up to 3 days – if you can even make them last that long. I hope you enjoyed this recipe, thank you for watching and I’ll see you in my next video. Rainbow Paint Splatter Cupcakes! More Rainbow Cakes with Cupcake Addiction….